Each year during the winter season, when the trees are bare and the weather cold,Â we take a walk around the property to see what tree may need rescuing from vines or brambles. One year we found a young cherry tree, pulled almost to the ground by tenacious vines. We removed what seemed like miles of the gnarly, prickly vines out of this little tree until it sprung up again, finally able to breathe. It seemed rather spindly and unhealthy, but we felt satisfied that we had given it a chance to thrive and reach for the sun once again. As the seasons passed, we walked by, we rejoiced in knowing that by allowing this little tree to have some space to spread it’s branches, it had grown to a healthy, balanced tree. This morning, as we took our walk, enjoying this beautiful gift of a day, we walked by this tree and saw a new vine trying to once again grab the tree andÂ drag down the branches. As we began to pull it out,Â to our surprise we saw nestled snugly in the crook of its branches a beautiful nest, expertly woven and lined with soft grasses. 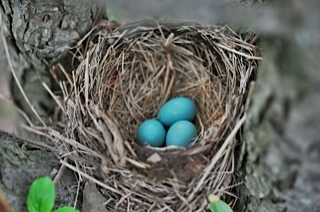 Even better, as we looked closer, we saw three precious eggs! We left quietly, so to not alarm the mother, delighted that by saving this scrawny tree one cold, winter’s day, we were able to see this amazing gift of life a few springs later. No matter how dragged down we get, it is never too late to pull out those vines, and see all the blessings hidden underneath. Start pulling! I’m taking a look forward to your subsequent post, I will attempt to get the grasp of it! Most casinos lay out these machines in sections. Don’t play more than one or two machines at a time. Then choose an island. Don’t worry as it is free. Hit the ‘free play’ button to play for free.